Composed by Wolfgang Amadeus Mozart (1756-1791). Arranged by John Leavitt. Shawnee Press. Children's Choir, Concert, Classical, General Worship. Octavo. 12 pages. Shawnee Press #E0385. Published by Shawnee Press (HL.35000662). Now available in two new voicings, John Leavitt's arrangement of Mozart's sparkling gem also comes with parts for violins, cello/bass and oboes. 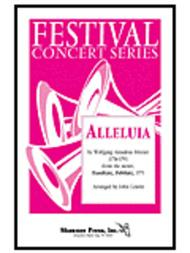 As a 2-part best-seller, Alleluia introduces children to Latin text and music of one of the master composers. Now middle school, junior high and high school singers can enjoy this work as well. Accompaniment/performance tracks available separately on Exaltation 2005 CD.